Sankt Gallen’s annual Valentine’s range includes the Sankt Gallen Imperial Chocolate Stout that weighs in at 9%. If you’re looking for a beer to get your date drunk on Valentine’s then Sankt Gallen Imperial Chocolate Stout is up your street. Alas, no chocolate is used during the brewing process, instead chocolate malt barley is one of the bases of the brew. It is usually on sale annually from the beginning of January for a limited time only. No chocolate was harmed in the making of Sankt Gallen Imperial Chocolate Stout. Sankt Gallen Imperial Chocolate Stout was chilled before serving as someone went OTT loading up the fridge with beers and this ended up in there too. It produced a frothy head of garguantuan proportions, that picture shows what happened when only half of the bottle was poured. After having the patience of a saint and letting it warm up a bit, Sankt Gallen Imperial Chocolate Stout had a thick, roasted-bitter chocolate smell that would be closest to a dark chocolate. Considering it is 9%, there wasn’t a discernible smell of alcohol coming off when chilled but when warm, it could be detected. Bang went the subtle idea of getting my wife drunk without her realising. Drinking Sankt Gallen Imperial Chocolate Stout is a quick process when it’s cold, it slips down that easily but then you miss out on the goodness of it. It really needs to be served warm so the flavours come through. The chocolate and coffee flavours were strongest when Sankt Gallen Imperial Chocolate Stout was cellar warm and not 2 or 3c straight our of the fridge. None of the flavours were over powering but the alcohol level is detectable after a while. The beer left me with a bitter, chocolate, coffee aftertaste that felt slightly sticky and parched but that was to be expected from an imperial stout. 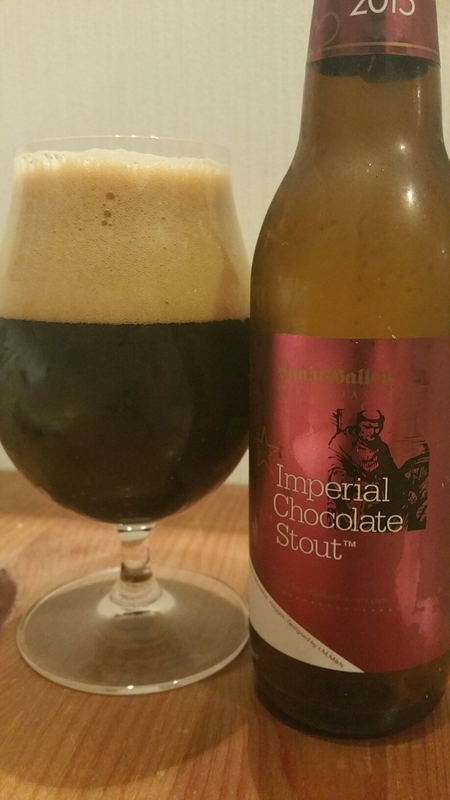 Sankt Gallen Imperial Chocolate Stout is a great dessert beer that would go well with some dried fruits. Buy two bottles, drink one and age the other. Sankt Gallen Imperial Chocolate Stout can be bought from the Sankt Gallen homepage here for a limited time only. Goodbeer has it here, World Beer Market Okadaya has it here, Craftbeers.up here. Le Collier and Nomono also had it in stock at the time of writing.